Dog Schidt Optiks are a team of artists, engineers and analogue creatives who specialise in building bespoke optics for the creative photographic and motion picture industry. With the push towards 4K and the increasing resolution of modern day lenses many shooters are looking to the past for a more organic and perhaps more filmic image. Dog Schidt lenses finds old salvaged German and former USSR designed optical components and takes them to the next level. The lenses are upgraded with a complete CNC machined rehousing, integrated focus gearing, as well as interchangeable drop-in aperture elements and optical modules. The lenses can be used as a very effective creative tool, imparting a physical baked-in aesthetic that is nearly impossible to recreate with digital post production. I caught up with Richard Gale from Dog Schidt Optics via Skype to chat about what the company does and why they do it. The TRUMP58 can be used with or without a follow focus. The increased focus throw of the wide diameter geared (0.8) focus ring allows for extremely fine adjustments and very precise 270° of focus pull. The ability to easily change aperture elements in under one minute opens up vast creative opportunities. While the integrated fluid ƒ2-ƒ16 aperture allows more traditional use. 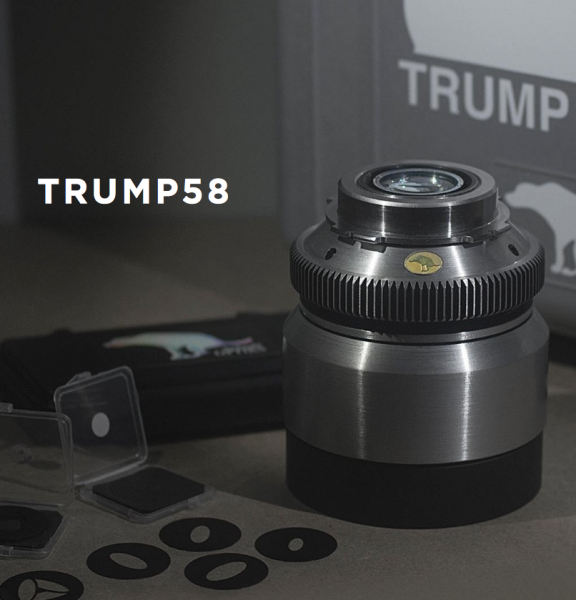 A selection of around 20 aperture elements is included with each TRUMP58 Base kit – 1.5x and 2x oval apertures from ƒ2.8 – ƒ8 allow an authentic anamorphic look by deforming the bokeh in the same way an anamorphic lens does. 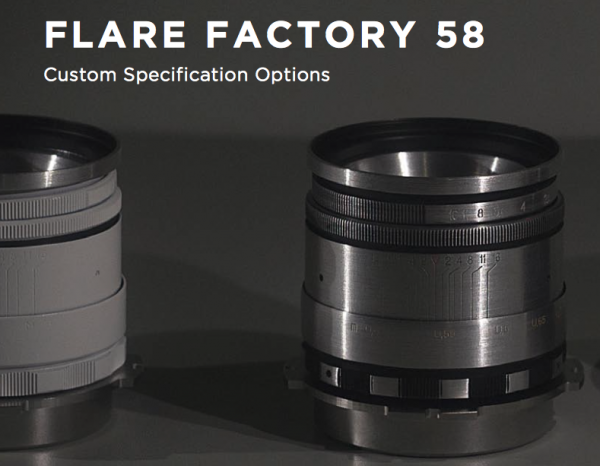 When used in partnership with our upcoming TRUMP58 Terry Norton’s Flaresex module, the system becomes the go-to for projects where cumbersome and costly anamorphic lens systems are unjustified. TRUMP58 also comes with a selection of less typical aperture designs which apply subtle and not so subtle bokeh distortions. CNC turned in aluminium alloy and carefully hand finished, TRUMP58 is solid and weighty, with a range of beautiful external finishes including brushed and lacqured metal, and numerous coloured industrial coatings. Industry standard PL mounts are CNC machined in stainless steel by skilled engineers in Britain. EF mount option is also available. The Flare Factory 58 was developed to impart a distinctly analogue and physical character onto digital imagery, and replace some of the tangible aesthetics that have been lost since digital acquisition and a reliance on post production has become commonplace. Each Flare Factory 58 is engineered, crafted and finished by hand in the UK, using salvaged former USSR and East German optical and mechanical components. Since each lens is rebuilt and individually configured, Dog Schidt are able to apply an almost limitless variety of optical degradations depending on your desired look. Whether you want a subtle low contrast lens that absorbs and reacts with the natural ambient hues of your shooting location, a nearly unusable ultra low contrast lens with wild tinted and almost light leak type reactivity to light sources, or a lens that simply imparts oval deformed bokeh to replicate the look from an anamorphic lens system, our FF58 can be configured to deliver these and many other qualities. The goal was to create a lens that was able to integrate both mechanically and optically with the Isco-Gottingen Iscorama and Iscorama 36 anamorphic lenses, whilst creating the humble aesthetic qualities associated with smaller anamorphics such as little 8mm projection lenses. The result is a distinctly vintage and lo-fi feel while harnessing the supreme sharpness and low light capabilities of the Iscorama. 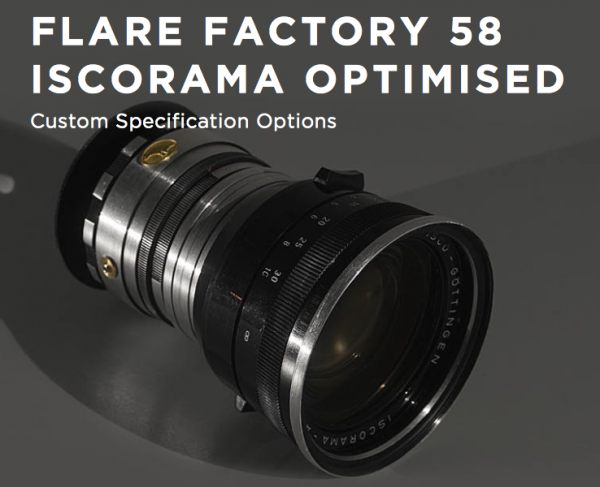 Additionally, the ability to lock the focus ring allows each FF58 Iscorama Optimised lens to be fine tuned outdoors and set to suit the particular ‘infinity sweet spot’ to coincide with an individual Iscorama. Finally, an extended tube with 49mm filter thread allows direct coupling to your Iscorama. These lenses are only suitable for Iscorama, Cinegon, 36 and 54 users. Please specify your lens model, as well as whether your Iscorama is a single coated or multi coated variant. Though you are invited to create your own configuration from the options overleaf, we prompt you to entrust us with creating a configuration that will best suit your particular model. Users of non Iscorama anamorphic lenses such as Sankor, Kowa 8z, Century, etc should select the standard FF58 and use a good quality lens clamp from Redstan.com, who supply the best anamorphic clamps in the world. Ultra high quality afocal wide angle attachment designed to integrate perfectly with the FF58. 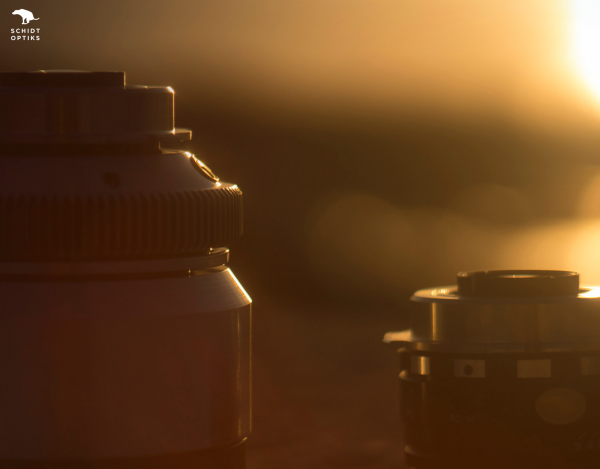 Increase field of view to a 38mm equivalent without degrading the optical performance or flare characteristics of the FF58- even when used on full frame 36mm x 24mm photographic sensors. Careful selection of rare earth ‘Lanthanum’ glass types has kept the number of elements to a minimum resulting in lower overall light transmission losses (<1/3 ƒ-stop). Designed as a direct extension to the optical make-up of the FF58’s double gauss design, the FF38 Optical Attachment delivers a 38mm effective focal length without degrading the optical performance of the FF58. Costly lanthanum glass types ensure optical transparency. The FF38’s primary goal is to deliver around a 1.5x wider field of view while maintaining the aesthetic and flare characteristics of the FF58 it is installed onto. The FF38 Optical Attachment boasts an 80mm front diameter suitable for direct matte box attachment, and 77mm filter threads allowing installation of high quality variable ND filters. An FF25 Optical Attachment and FF58 Non-optical Attachment will be available soon- both sharing the same external body design and 77mm filter thread. This strategy will allow the user to build up a compact shooting set where optical characteristics and aperture settings (dictated by the configuration of their FF58) are uniform across all three focal lengths (25mm, 38mm, 58mm) - As a result, users have the option to build up a set of various FF58’s of different optical configurations while only needing one of each front mounted Optical attachments.